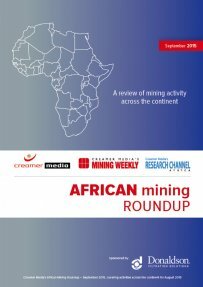 The African Mining Roundup is a synopsis of mining activity on the continent. The September 2015 roundup covers activities that happened in August in 28 countries. It includes about 120 separate news items in an easy-to-read, disaggregated format. This month’s report includes details of potash hopeful Elemental Minerals’ launch of a bankable feasibility study on its Kola sylvinite project and a prefeasibility study at its Dougou carnalite project, in the Republic of Congo; diversified hopeful Lemur Resources’ signing of a binding term sheet with JSE-listed explorer Sable Metals and Minerals to acquire stakes in three vanadium projects, in South Africa; and JSE-listed Petmin’s subsidiary Tendele Coal Mining’s conclusion of a two-year wage agreement with the Association of Mineworkers and Construction Union and National Union of Mineworkers. Published on: 04 September 2015.